Material: wood+heavy gage steel construction. Smooth finish and great looking. Comes with removable ledge pencil slot. Great Size - 47"(L) x 24"(W), large enough for daily use, suitable for both adults and children. High Quality Material - the panel is made of particle wood with high glossy and smooth finish, it is very safe and comfort to use. Heavy gage steel construction for excellent stability and durability. 5 Adjustable Height Levels - it can be adjusted in 5 levels, perfect for drawing working. The pen can be place in the pen slot, the slot can also be remove when using it as writing desk. 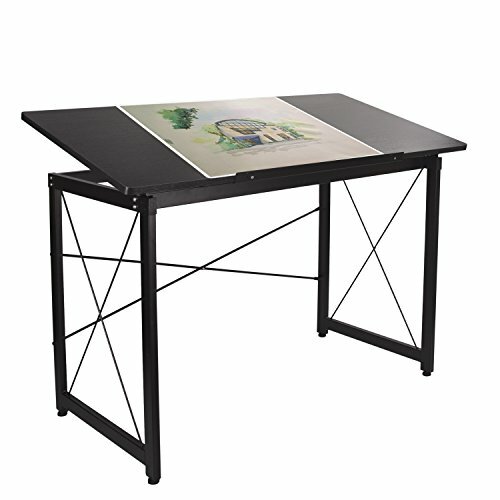 Versatile Design - it's not only a writing desk but also a drafting table with tiltable surface, perfect for adults or children who has demands on both writing and drawing. You can also use it for head up reading to effectively prevent neck pain. Easy to Assemble - M-style buckle design, esay to assemble and firmly connected. All parts, tools and instruction are included.